Granada, also known as the most beautiful city in the world, the magical city, the city of the three cultures… There aren’t enough expressions to refer to this magnificent city, which without a doubt you must visit in order to be able to see and be enchanted by its multiple charms and create your own expression to describe this city. In it, it cannot be denied that there is something magical that revolves around it, that will leave you with the aim of coming back. Its most popular symbol is the Alhambra, declared World Cultural Heritage by the UNESCO. However, its spell is also hidden in its streets and cultural art pieces such as the Granada Cathedral. A city that is simply hard to put into words that you must visit in order to understand its international renown. After this short introduction, I cannot wait to start my adventure in this incredible city so without further delay, let’s discover Granada! My trip around Granada has tried to include the most beautiful and typical sites nobody would like to miss. But if you want to discover special and hidden places, that are harder to see, we recommend Granada’s blog by Molly: Piccavey. I finally made it to Granada and right after my arrival, I started to wander around its streets to start my highly expected visit in the Andalusian city. 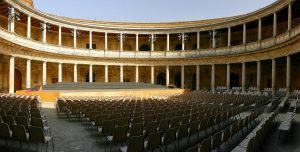 I started in the Corral del Carbón, which dates from the XIV century. Receives its name because it used to host coal merchants and also serve as a warehouse for goods. We can visit its impressive patio that collects water from the Darro and Genil rivers. Only a few minutes walk from the Corral del Carbón we can find the next stop of our Granada’s adventure, the Cathedral of Granada. 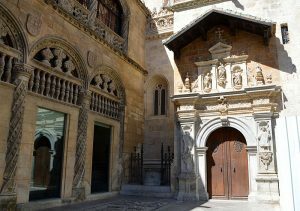 The Cathedral of Granada is without the shadow of a doubt one of the symbols of the city, which was built in the XVIth century and has become one of the emblems of the history of Granada. In fact, curiously, this cathedral was a project imposed by Isabel The Catholic in the same spot where there was an old mosque, which shows the conflict, and at the same time, the coexistence between the different religions and cultures in the city. You cannot miss out its interior. Its central chapel is without a doubt one of its most appreciated jewels, culminated by an impressive dome, that will leave you speechless. The visit around the cathedral will also enable you to visit all of its rooms, as well as all of the most hidden corners of this majestic cathedral. Certainly, one of the “must see” of Granada, which has become one of the treasures of the Renaissance. 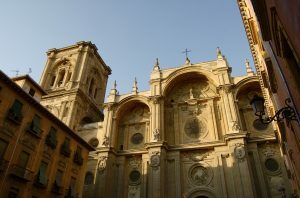 Only a couple minutes away by walk from the Cathedral of Granada, we get to the Royal Chapel, a catholic temple located in the center of the city. It is an amazing chapel that holds the remains of the Catholic Kinds, which makes it one of the principal historical spots of the city. Furthermore, not only is the history what makes this chapel a very attractive place for travellers and tourists, but also the beauty of its altarpieces. A mandatory stop in the city! Following the visit to the Royal Chapel, I headed to the Art Gallery of Granada, located only five minutes away by walk from the Chapel. Without a doubt, an art gallery like no other. In it, you will find art pieces of all kinds and styles, since one of the main pillars of this gallery is the exposition of paintings and sculptures of all types of artists, background and styles, which makes the exposition completely unique. A very interesting visit before making my first gastronomic stop of this trip. As I walked around the centres of the centre of the city, I decided to stop in one of its traditional restaurants to enjoy a typical “olla de San Antón” and eat some delicious Piononos (that you must try before leaving Granada!) to give the perfect end to a great meal. A break that left me with a great taste of mouth to resume my visit around Granada. After this enjoyable meal, I went to make my last stops of the day: the Monument of the Water Seller and the Trinidad Square. Just a brief explanation of the former, the water seller was a job brought about to Spain by the arabs which consisted in selling water around the city. To this matter, this statue made of bronze located in the Romanilla Square, makes up one of the hidden and not so popular places of the city. My last stop was in the Trinidad Square. It is a small square that connects the principal streets of the city. 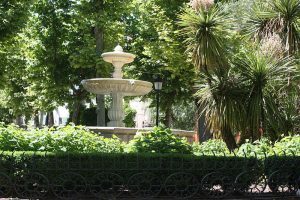 There, you will find the famous fountain of the square, which is the only remaining sign of the arab era, before the reforms carried out by the Catholic Kings. An enchanting place that along with the nature that surrounds it, constitutes a very relaxing walk, perfect to end my first day in Granada around its main streets. The sun shines in Granada and my second day in the city of three cultures starts. As it could not have been any different, I decided to spend the day discovering the secrets that the Alhambra, the jewel of Granada and World Heritage holds. There are numerous spots that you cannot miss out on in this unique place, like for example, its spectacular parador, which will enable you to enjoy some incomparable views. Certainly, the Alhambra will leave you speechless. Each corner, each room, each ceiling, each wall, have a special charm that will fascinate you. Additionally, there are some symbolic spots in the Alhambra that you must see. Among them, there is the Court of Lions, a magical courtyard with a main fountain that gives the name to the patio. Right next to this court, you get to the Damas tower, constructed in the XIVth century that constitutes one of the few remainders of the Partal Palace. Another spot that you must visit in the Alhambra is the Alcazaba (of which you can also visit its interior), the oldest part of the Alhambra, that goes back to the IXth century, and which presence is due to the project of Mohamed I to build a wall around the enclosed area. After my visit to the Alcazaba and its towers, I headed to another key stop in the Andalusian city, the Palace of Carlos V, only five minutes away from the Alhambra. This palace is one of the symbols of the conflict among the multiple coexisting cultures in Granada. 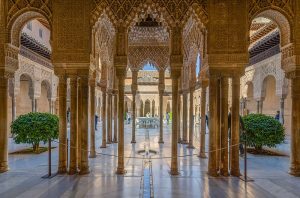 In fact, it was built by the roman emperor that gave the name to this palace, as a result to the presence of the Alhambra, a muslim construction. You cannot leave without seeing its circular court, one of the most special places in this palace. Another place that you cannot leave Granada without visiting is the Palaces. There are three palaces that were used as residence by the kings of Granada. Certainly, its fountains, main element of their courts and garden will leave you stunned and it is for sure worth spending some time walking around its surroundings. 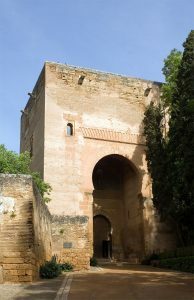 Following my visit around the palaces, I headed to another symbol of the city, the Gate of Justice, which is the most important external gate that leads to the Alhambra, since in it you can see muslim signs as well as christian signs that were implemented with the arrival of the Catholic Kings. Therefore, the Alhambra is without a shadow of a doubt, the treasure of Granada and one of the main historical symbols of the country since it shows the evolution and the conflict between the muslim culture, present during the Al-Alandalus and the establishment of christianity by the Catholic Kings. Not only is the Alhambra a unique place from a cultural and historical perspective, but it is also so from a aesthetic perspective, as its beauty is worth seeing and admiring in person. A mandatory visit in Granada that will for sure not disappoint you! The night was starting in Granada and I decided to live a typical Andalusian night in a gypsy neighbourhood. To be more precise, I went to Cueva La Rocio, where you can take some flamenco lessons and enjoy a dance show of this typical Spanish dance along with a typical Andalusian dinner. Certainly, a very unique and memorable option that was the best way to finish a great day in Granada! 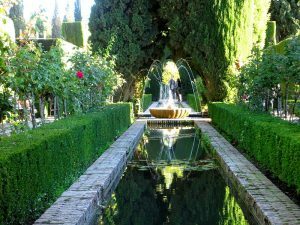 My last day in Granada had come and I decided to spend the day in Generalife. A highly pleasant visit, thanks to its gardens, which without a doubt were worth visiting before leaving the city. Other places of interest in this enclosure is the theatre of Generalife, in which you will be able to enjoy outdoor dance shows, which will ensure you spend a unique evening. After this memorable visit, I headed to the Jardines Alberto Restaurant, located in the entrance to Generalife, which contains numerous terraces, including a panoramic terrace. The best place to enjoy the last dishes from Granada! Granada is a magical place, hard to describe with words, that is certainly worth visiting. Its combination of culture, its nature, its inhabitants and its atmosphere make of the city a unique place that you just cannot miss out. 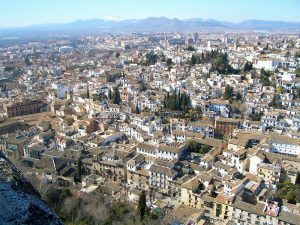 As a result of its known charm, Granada is one of the most frequented cities by tourists, which makes it compulsory to get your tickets on advance to some visits, especially to the Alhambra or the tour around Generalife. In order not to miss out on the most valuable jewels of the city, you probably want to have your portable wifi in Granada to make the most of your visit!